BLUE SEASON BALI STAFF – HERE FOR YOU! Mark is from Bristol in the UK and originally came to Blue Season Bali to further his scuba diver training. After falling in love with Bali and getting caught by the charm of the island Mark made the decision to become a part of the ownership team, he has now been in this position for over 6 years. Share a part of the dream with him and meet him here at BLUE SEASON. Wakaba San is from Japan and is a founding member of Blue Season Bali. She has been a driving force behind the business for over the last 15 years and is still very much involved with all aspects of day to day life at Blue Season Bali. Sila is another founding member of Blue Season and also plays a very active role in the day to day operation of the business. For example he may be your boat captain on the day you dive so say hello and share some stories. Karoline was born and raised high up in the alps and naturally learned to ski before she learned to swim. She learnt to dive in a very cold Swiss lake. 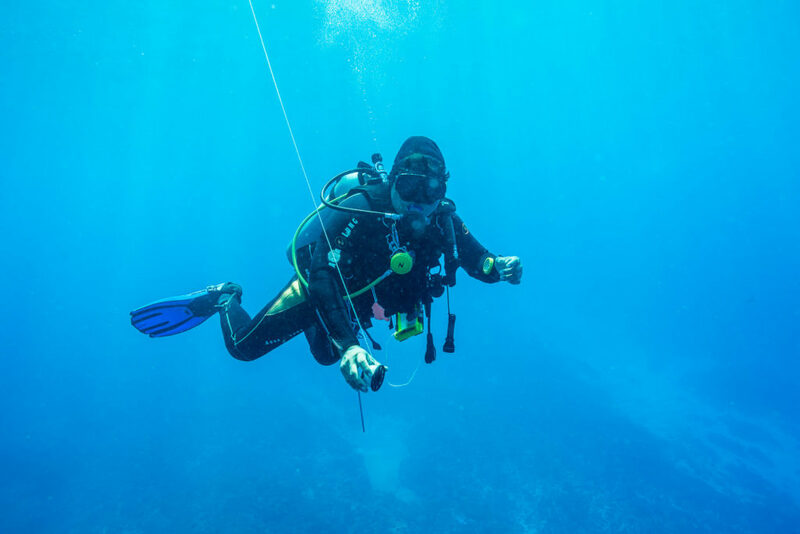 After finishing her Rescue Diver Course in a dry suit, she decided that there was no way that she would go on to do a Divemaster course in a cold environment. So, after falling in love with Indonesia on a dive holiday and being able to take a break from running a hotel and restaurant in Switzerland she ended up in Sulawesi where she furthered her diving education. She then went on to work for 2 years on Lembongan island and has finally settled in Bali where she says she loves the food, the people and the diversity of the dive sites. Putu is a true diving legend around Bali. Diving is his life, he has been diving in Bali since 1991, and with us at Blue Season Bali since 2005. Originally from the village of Sumerkima, next to Menjangan, he started working as ranger in the National Park. Since finishing high school, he has worked as a dive professional in Bali. He is a specialist at finding macro creatures and a truly expert mola-mola spotter, so you can’t be in better hands when it comes to discovering the marine life around Menjangan Island. Besides Bali, Putu has dived in Lombok, Manado and Wakatobi. Putu speaks English, Japanese, Indonesian and Balinese. My name is Eugene and I am a PADI Master Instructor, I am from Seattle Washington. I began my Diving career in Mexico about 7 years ago and haven’t stopped since. I have worked for a Marine Conservation Project in Mexico, managed a dive center in Vietnam and worked as an Instructor in Utila, Honduras before arriving in Beautiful Bali. I love teaching all levels of PADI courses but my passion now lies in Professional level training, Conducting Divemaster workshops and assisting on IDC’s, I also enjoy fixing equipment as a form of therapy! Sam is a Master Instructor and Technical Instructor and has been diving for 8 years. He started his journey in the UK and has worked around the world in both warm and very cold waters. His passion is training professional level dive masters and assisting our course directors on IDC courses. He likes to keep his standards very high when teaching those who wish to visit our deeper reefs. Big lover of anything wreck, you will find him happily hanging in the blue with his sidemount gear! Knez is a creative sales and marketing professional with more than 5 years experience. She comes from South Sulawesi island and loves diving world too much! One minute she’ll be talking about the wreck ship in the ocean, and the next she’ll be looking at growth numbers on a huge spreadsheet. She is ready to greet you in Blue Season Bali. Tanty has been working with Blue Season Bali for over 2 years now. Starting as a reservation staff till promoted as the Sales & Marketing assistant, yeayy! She is a fun person but very serious when working with the emails. Watch out new customers! Tanty will take your heart to dive or snorkeling with us. Wayan is one of our most experienced Instructors here at Blue Season Bali. With over 10 000 dives in Bali alone. Wayan heads up our team of Dive Guides and is a true genius in the water. He speaks his mother language Indonesian, English and Japanese. Agus is a really valuable addition to the Blue Season family, his enthusiasm is really infectious. He also got an award from PADI Membership Achievement Awards for reaching his 5th Anniversary as PADI member. In his leisure time he goes for runs and joins his friends to play basketball. Dino was born in Jakarta, the capital city of Indonesia. He started his diving career in 2011. He loves scuba diving too much as he feels that being underwater is like being one with the nature. He began to work with Blue Season bali since 2016 as our PADI Instructor and always make sure the guests will have their unforgettable diving experience. Edwin’s roots are set in Sulawesi, an island 3 hours north of Bali. Edwin has travelled a lot of the Indonesian islands and feels great having finally settled at Blue Season Bali. He received all of his training at Blue Season Bali and speaks his mother language Indonesian, English and a bit of Japanese. Edwin thinks that you meet people for a reason and not by accident. So let this become true for you. Jenny grew up in a landlocked city in Canada, but always felt most at home when she was near the ocean. She never had a desire to dive, but on a trip to Thailand in 2009 was convinced to take the Open Water Course. For Jenny, it wasn’t love at first dive. In fact, after the first dive she didn’t think she would ever go diving again once she finished the course. Fortunately, the second dive got her hooked when she saw a turtle and a shark! Since then, diving has been her passion and she is thrilled to teach others to dive and introduce them to the underwater world. Komang was born in Sumerkima, next to Menjangan National Park. His passion for the sea led him to start work as a boat captain, going to Menjangan Island every day. He wondered how the island looked underwater and since trying diving over seven years ago, he has fallen in love with underwater world. Expert at finding the elusive mandarin fish and the tiny pigmy seahorses, he is also the equipment wizard of the dive centre as well. When he is free he loves spending time enjoying the natural surroundings of the National Park. Komang speaks Indonesian, Balinese and English. We have a fantastic reservations team here at Blue Season Bali. Our team will be more than happy to assist you with your hotel, pick ups, booking or even just about Bali in general. They look forward to welcoming you to Blue Season Bali. Our accounts team is made of Mira, Lia and Dina. They are always on hand to assist you with your payments or to handle any financial enquiries. Koming heads up our Equipment team here at Blue Season Bali. He and the team are always smiling and happy to help. Wid, Ibu Ani and Wayan make sure that Blue Season Bali is always sparking and clean for you.